How do YOU treat YOURSELF? “Love Thyself First”. I will inspire and motivate you with words of encouragement and love. How do YOU “Refuel Your Tank”? Do YOU take a day to “recharge your batteries”? In this very rushed world, we forget to take a down-time day every week to take care of ourselves. It is very important for us to take some time to de-stress, decompress, and revive our body and soul. I will lead you through the importance of taking a much needed day of rest! If you do not give your body this rest time, you may suffer from insomnia and it can even lead to conditions like adrenal fatigue that cause additional physical symptoms that can FORCE you into down-time… in the form of a cold or flu, or even worse! HYB What Happens When YOU are BROKEN? How Do YOU Heal Yourself? Women are born to be caretakers. It is part of us. We are genetically programmed to take care of others. During that process we fail to take good care of ourselves. As a result, we put ourselves last on the list and many times are the first to experience adverse consequences like disease and illness. In the process of trying to achieve my version of “perfection” and taking care of everyone else’s needs before my own, I was faced with health challenges and mental anguish, so much so, that I had become “broken”. So what do YOU DO when you have become “broken”? How do you heal yourself from this place? When Joseph Campbell described “The Hero’s Journey”, he spoke to the most difficult struggle you will have in your life leading you to the most amazing outcome you can’t even possibly imagine. Personally, I had to hit rock bottom before I could begin to find a way out of the chaos and pain. In fact, I am experiencing the Hero’s Journey right now. Louise Hay teaches us that we are molded from youth by ideals we learn from our parents. However, YOU cannot blame your parents for your current situation. No manual exists for how parents can be perfect parents, and unfortunately in most cases, our parents were not aware they were doing anything wrong because they learned by example from their parents. She teaches us to let it go and forgive them, and urges us to not harbor those feelings of resentment and anger from our childhood. To truly begin healing our body and mind, we need to practice healing affirmations of forgiveness. This practice is incredibly empowering! Today’s message is to LOVE YOURSELF and practice loving affirmations and forgiveness to optimize your healing process. 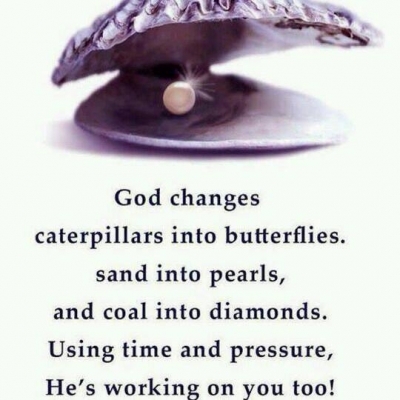 YOU are a “Work-In-Progress”… God’s Not Done With You! What exactly is a Bucket List? I personally like the definition that was used in the movie, The Bucket List, “All the things you want to do in life before you ‘kick the bucket”. When I referenced the official Google dictionary, the definition is as follows, “a number of experiences or achievements that a person hopes to have or accomplish during their lifetime.” So, it is essentially the same definition.